Your Online Print Services Site is now up and running! 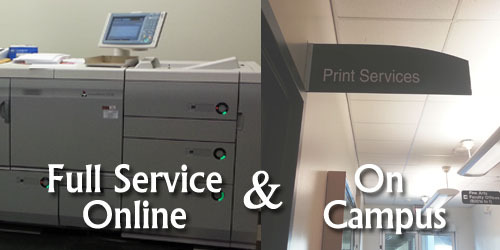 The 49th Avenue campus Print Services shop offers full service printing, binding, laminating and other finishing services for all of your projects. Have your documents, 11x 17 Posters as well as brochures and booklets printed though the printshop for better pricing than printing at home or even at other printshops. Submit your print jobs through our online site below or visit the Print Services Shop in B004 for service. Payment for public and student services will be made at the Bookstore. Please obtain a receipt from the Printshop or order online and bring your receipt into the Bookstore prior to picking up your order. Please click on the student site button below to begin. First time users will need to register. As a user, you may download the Print Services messenger print driver right onto your computer for added convenience. Welcome! Please use Langara’s new Online Print Services Site to upload files and place your print orders from the comfort of your office or even your home. PLEASE NOTE: This site is for Langara staff and faculty only (you will need to use your department index code for payment). For Student or Public use, please use the student/public site. The site is easy to use and allows you to preview your online order, save a job until you are ready to send it, and even keeps your files accessible for future reprints. You may also add the Print Service onto your computer as a printer option. Click for details on the printer driver here. Langara Print Services is now operating as an online service, and will no longer be using print requisitions in paper form. Please view our short HOW TO presentation, or enter the website by clicking the button below.